It was a fine late spring evening with high temperatures and the brethren of Anfield Lodge No 2215, together with their guests, met in the Geoffrey Hirst Masonic Suite of Woolton Golf Club, to welcome a new brother. Pictured from left to right, are: Phil Lyon, Graham Bass, Andy Whittle and Stephen Lyon. WM Andy Whittle welcomed everyone and opened the lodge in the first degree. After the usual opening business had been transacted, a ballot was held for another prospective new member and this proved unanimously in favour. Details of the initiate were read and it as at this point the treasurer and secretary usually retire to attend upon the initiate, but on this occasion, they informed the WM that the papers had been signed and the initiate had made a generous donation to charity. 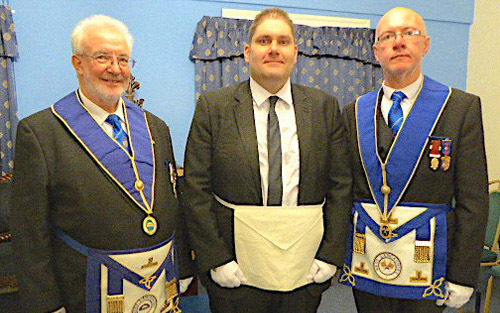 Two stewards were asked to attend upon the candidate and later returned to the lodge. The acting inner guard Stan Dawkins announced that Graham Bass having been prepared, was outside the door of the lodge. The junior deacon Stephen Lyon, who was the candidate’s proposer, together with acting senior deacon Phil Lyon, who was the candidate’s seconder, met Graham at the door and escorted him into the lodge, where he answered the usual questions with candour and then proceeded to take his obligation. The ceremony was carefully watched over by experienced DC Garry Devlin, who ensured that everything ran smoothly. Pictured from left to right, are: Phil Lyon (seconder), Graham Bass and Stephen Lyon (proposer). The working tools of an entered apprentice Freemason were soundly delivered by Stephen Lyon and the senior warden Alan Ledger delivered, in eloquent fashion and sincerity, the charge founded on the excellences of the institution and the qualifications of the members. The WM informed the newly made brother that he was now at liberty to retire to restore himself to his former comforts and then return himself to the lodge. Graham retired from the lodge and on his return the WM had much pleasure in presenting him with a set of white gloves and providing him with an explanation of their significance. Graham was also presented with a festival tie. On taking his seat the WM introduced Graham to the new group mentor Ian McGovern and his assistant Harry White. The secretary reported receipt of a Grand Lodge certificate for James Watson and the WM had much pleasure in presenting it to him and in due fashion the WM closed the lodge after the secretary had informed the brethren of any other communications. The tyler was admitted and the DC Gary Devlin formed the procession to retire. The evening had been very enjoyable, well managed and one that Graham would for ever remember. Pictured from left to right, are: Phil Lyon, Alan Ledger, Graham Bass, Andy Whittle, Stephen Lyon and Eric Carroll.